Participate in School Cultural Performance and Education: Niwot, Monroe, Bennet. NOTE - To display this video, set your browser: (Tools >Internet Options> Security > Custom Level > ActiveX Controls & Plug-ins > Enabled) and have Adobe Flash Player ActiveX. If popped-up with "Allow Blocked Content" in the bottom of the screen, click this button. Sunday, August 18, 2013, from 12.30 - 2.30 pm. at Colorado History Museum, 1200 Broadway, Denver, CO. Partially sponsored by NEWMONT & Colorado Council of The Arts. 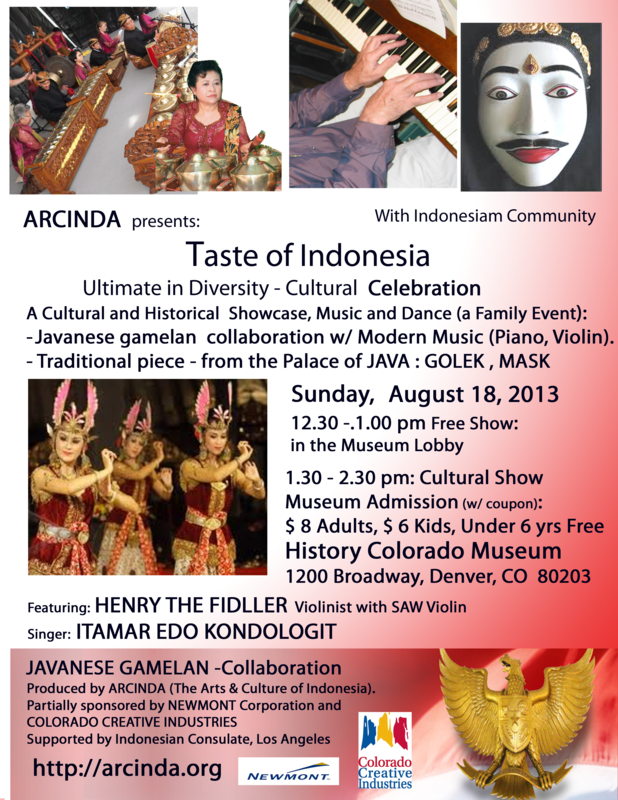 Featuring: Gamelan and Collaboration with modern music with HENRY THE FIDDLER - MUSICAL SAW VIOLINIST . at Denver Museum of Nature & Science. Address: 2001 Colorado Blvd, Denver.Sunday, August 18, 2013. FREE ADMISSION in the Lobby, 12.30 -1.00 pm. But, required Museum Admission Ticket, from 1.00 - 2.30 pm, in The Auditorium. 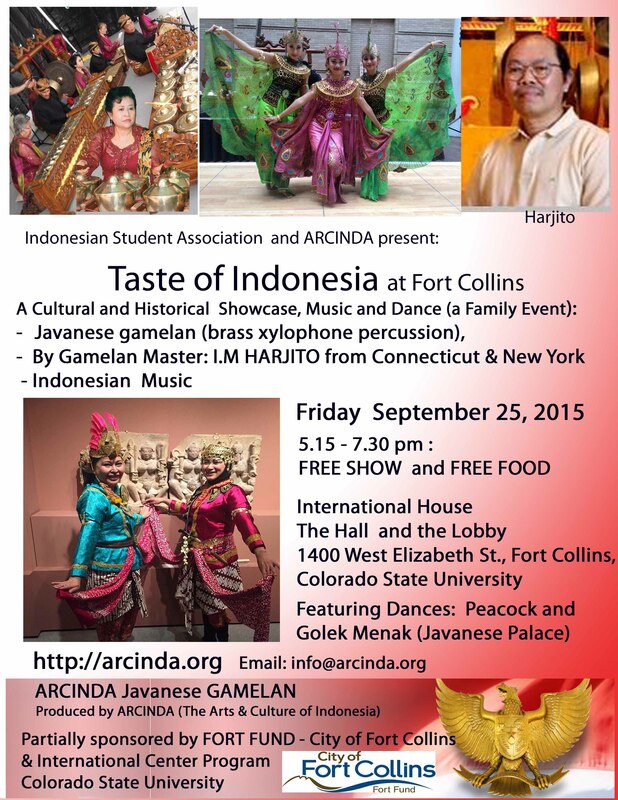 INDONESIAN NIGHT presented by IELSPIELSP COHORT at Colorado State University (CSU), Fort Collins, Indonesian Student of CSU, and ARCINDA (The Arts and Culture of Indonesia). Free Admission. Ultimate Diversity - Cultural Performance. JOHNSON HALL THEATER, Colorado State University. 900 Oval Dr. (East Drive) , Fort Collins, CO 80523. September 18, Tuesday, from 5.00 - 6.30. Cultural Performance from different regions throughout Indonesia. Follow by 6.30 - 7.30: Free Refreshment and Reception at Alder Dining Hall. Partially sponsored by City of Fort Collins. 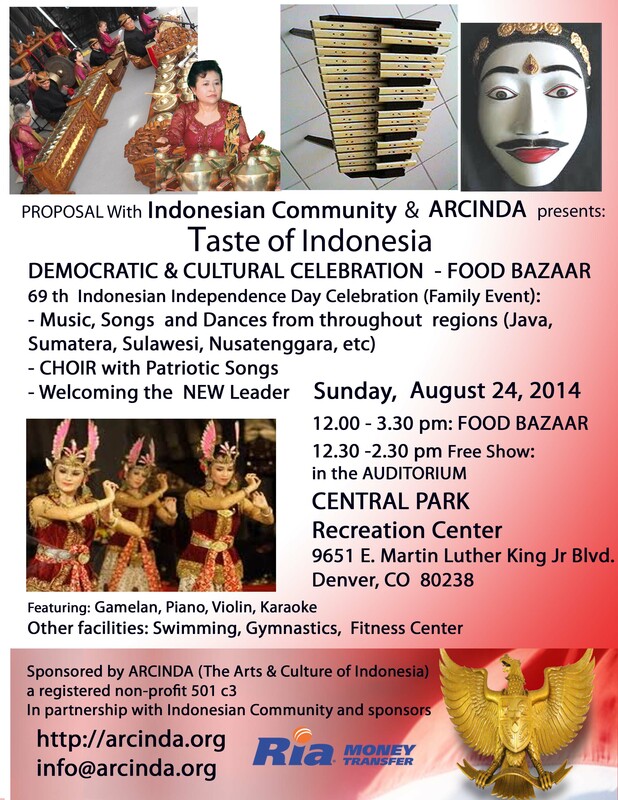 TASTE OF INDONESIA 2011, Indonesian Independence Day celebration: SHOW and BAZAAR. Guest Artists: ATIK CB and REY WOWOR. Saturday, August 20th, 2011. at Davis Auditorium, Strum Hall, University of Denver. 2000 E. Asbury Ave., Denver, CO 80208. 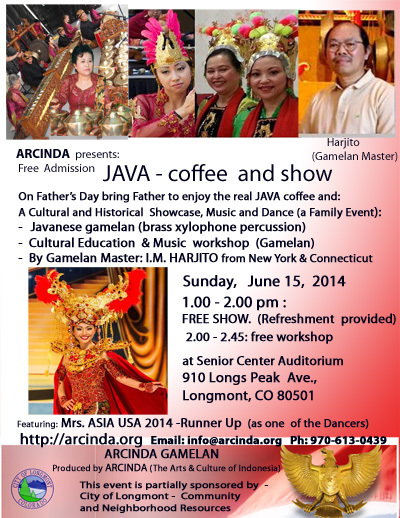 JAVA - A Family Event. Saturday, July 30, 2011. 6.30-.7.00 pm: Free Admission. Pre Show: Arts & Kid Program. 7.30 -9.00 pm:Cultural Show, with ticket, at Bas Bleu Theater, 401 Pine Street, Fort Collins. 1669 Euclid Ave, Boulder CO 80309, CU Boulder, Boulder. Presented by: CU INTERNATIONAL, CU Boulder. Performing several Classical and Modern Music. 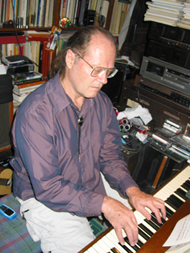 Sheikh Saleh (Lawrence Frey), native of Colorado, studied piano from many teachers from the age of five, winning numerous classical contests. At fifteen, lead guitar in a professional rock band, formed and led a folk music quartet. Rachmanoff's piano works and Brazilian samba guitar are two continuing loves. He has traveled through many cultures, sings in fifteen languages, teaches and performs on many instruments, and continues study and performance of world music and the use of voice in Sufism and other spiritual traditions. 2) PIANO (by Lawrence Frey) in combination with Indonesian - Javanese Gamelan, Kyai Brojo Marto, of ARCINDA (a non-profit organization). is a unique collaboration to transpose and tune a Javanese Music into a modern western music, and be played together with a piano or modern band. August , 2009 - 2012. at Pearl St Mall Stage. Sunday, August 22, 2010, at Arvada Gymnasium. Where: SLOAN LAKE (25th & Sheridan), DENVER, CO.
RENDEZVOUZ at an INDONESIAN MARKET PLACE. 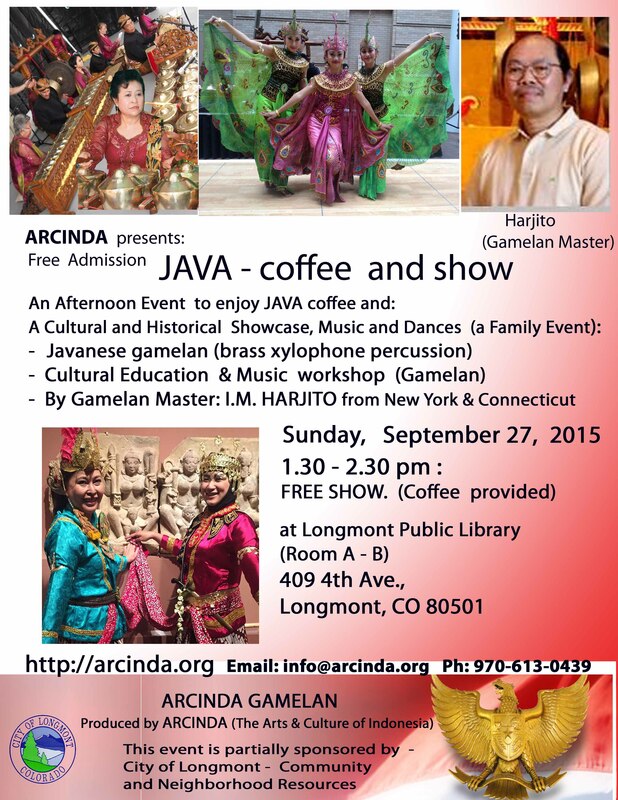 A relaxing Javanese Music & Dance Performance, and Lunch. Mixed Tropical Fruit Drinks (es campur). Show: 2.30 pm. Where:Theater/Senior Recreation Center, 1200 Raintree Drive., Fort Collins, CO 80526. Tickets: $ 12 (Members); $ 16 (Public - Non Members). ALSO, PLEASE ATTEND: 2 MONTHS Series of Indonesian Presentations. Exploration and Adventure to JAVA, Indonesia. Where: ORIENTAL Theater, 4335 W. 44th Ave., Denver, CO 80212. Tickets: $ 12 (Advanced purchased); $ 15 (at door). BENEFIT EVENT for the victims of Indonesian earthquake. Saturday, November 28, 2009. Time: from 6.00 - 9.00 pm. Place: Crowne Plaza Hotel, at DIA. Address:15500 E. 40th Ave., Denver, CO 80239. Any additional donations are welcome. Mailing Address:2901 Virginia Dr., Loveland, CO 80538. 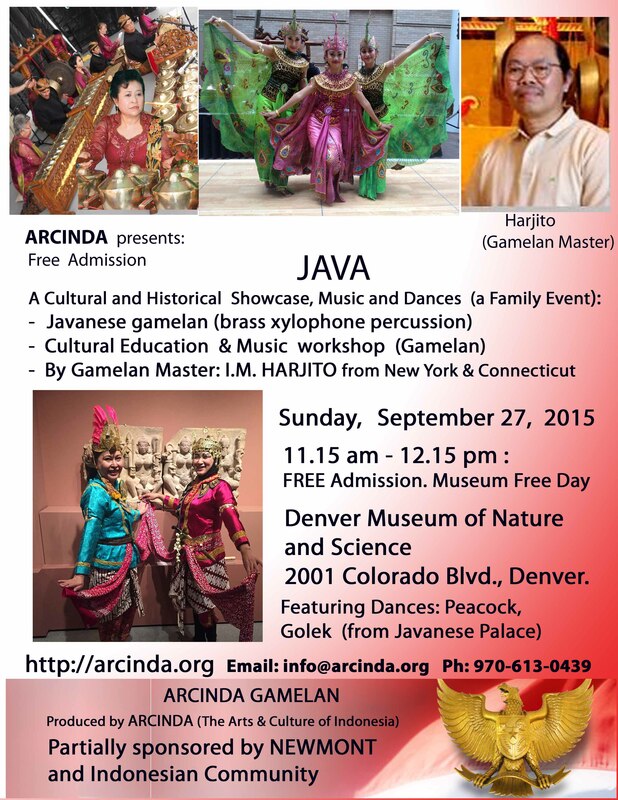 Organizer: Indonesian Community Center (ICC-USA) and, ARCINDA (The Arts & Culture of Indonesia is a non-profit organization with 501 number. Thank you very much for your contribution and helping to distribute this information to your Community.